There’s always a shocking release during the final roster cuts. This one was indeed a shocker. The Cleveland Browns released cornerback Joe Haden Wednesday morning after seven seasons with the franchise. The 2010 first round pick was scheduled to make $11.2 million this coming season and the team had asked Haden and his agent Drew Rosenhaus to take a pay cut, they elected not to so the Browns released him. Haden will get $4 million guaranteed from the Browns and is now a free agent for the first time in his career. It’s believed he will be heavily pursued by teams who need cornerbacks. ESPN’s Adam Schefter reported that the Chiefs, Steelers and Saints were among the teams interested. This comes after reports came out Tuesday that the Browns were “aggressively” looking to trade Haden. Obviously the team couldn’t find a trade partner. Haden ranks 15th in franchise history with 19 career interceptions, the most for a player since the team’s return in 1999. He also made two Pro Bowl appearances in 2013 and 2014 and was selected as a second team All-Pro in 2013. However after he signed an extension in May of 2014, Haden’s performance on the field started to decline and the injury bug started to hit him. A concussion during the 2015 season limited him to five games and last year despite playing in 13 games, he had to undergo surgery on both groin muscles during the offseason. Through it all, Haden made Northeast Ohio his home and embraced the city that embraced him when he was drafted here which made him a fan favorite. Haden is a diehard Cavaliers fan and you would see him court side for games constantly. You’d also see him at Cleveland Indians games as well. 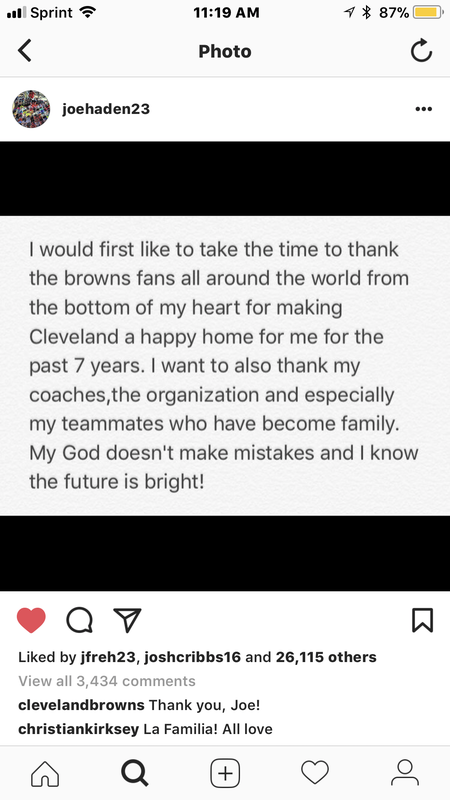 I know people will criticize the Browns for the move and the timing of it but if he wasn’t making an impact to the level of his contract, it was his time to go. Browns radio play by play announcer Jim Donovan stated on Monday that he thought Haden was the third best corner on the roster behind Jamar Taylor and Jason McCourty. I think you could also make a case that Briean Boddy-Calhoun is emerging and would eventually jump Haden as well. This move won’t shakeup the Browns plan for this season because the youth movement has been felt all over the roster since Sashi Brown and Hue Jackson took over nearly two years ago. The team may not look better now on paper but I think for the long term status of the organization, we’ll look back and say this was the right move. Joe Haden has agreed to a three year, $27 million dollar contract with the Pittsburgh Steelers. ESPN’s Adam Schefter is reporting that Haden had better offers on the table but he wanted to be in Pittsburgh. He’ll make $7 million this season, which is what the Browns wanted him to lower his 2017 salary to. Clearly Haden wasn’t taking a pay cut for a rebuilding team but would to compete for a championship.